In honor of Earth Day we're celebrating all things green minded. It's Easy Being Green! Greenlee’s Bakery is a family owned and operated bakery that is driven to bring you the finest, freshest baked goods at reasonable prices. 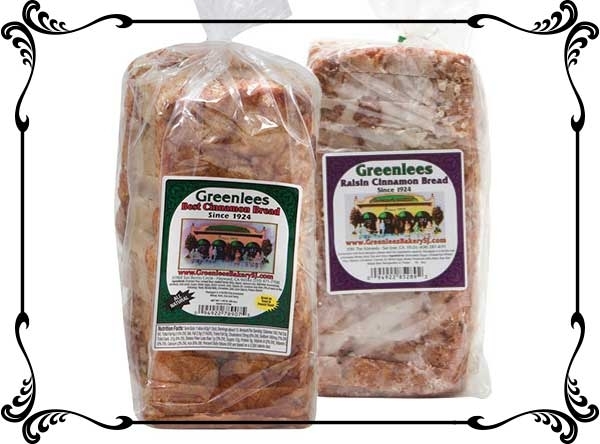 This Saturday and Sunday, buy one loaf of Greenlees bread, get a second one free! 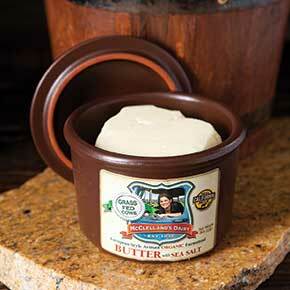 Looking for local, organic, environmentally sound, European–style butter from grass–fed cow’s milk? Look no further than your neighborhood Nugget Markets dairy department! McClelland’s Dairy Artisan Organic Butter has a higher butter fat content for amazing, robust flavor and it’s churned in small batches for perfect texture. With added sea salt from the Sea of France, McClelland’s is then packed in a reusable ceramic crock, perfect for a refill. 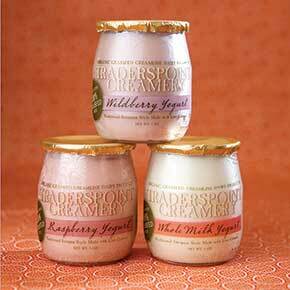 Organic Traderspoint Yogurt is made from 100% milk from grass–fed cows and is available in plain, raspberry, banana mango, wild berry and vanilla varieties. Packed in recyclable glass jars, Traderspoint Yogurt is higher in Omega 3s, cancer–fighting CLA’s, and probiotics than other snack–sized yogurts. It’s yogurt that you can feel good about. Chai Baba Chai teas come from a local ecologically friendly company and are made using a historic recipe from Bombay. Natural, organic, and made with love, each micro batch is slow-brewed using time-honored brewing techniques. Available in our dairy department. One day, a group of friends with a vision got together and created products that balance style, function, sustainability, and affordability in every single one of their products. Full Circle is the realization of that vision, offering well–designed, long–lasting cleaning items made from natural, eco–friendly materials. 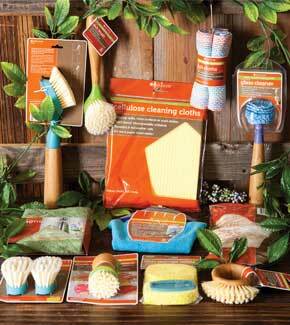 Full Circle earth–friendly cleaning tools are tough on grime and dirt, yet kind to the earth. Choose from such easy–on–the–planet products as dish cloths, loofah scrubber sponges, and magnetic towels to dish brushes, potato brushes, and glass cleaner tools, just to name a few. Plus, with each creatively designed product, living and cleaning “green” never looked so good. Selection varies by location. When the soil warms up, it’s time to sow some seeds! 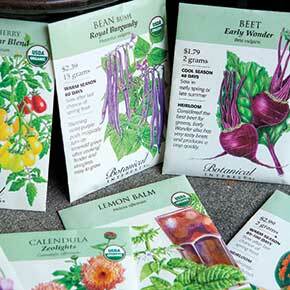 Botanical Interests organic seed packs are high–quality organic growing seeds for your garden. Whether you’re into flowers, vegetables, herbs or fruits, there’s a little pack of something for every gardener’s plot. Organic and family owned since 1995, Botanical Interests offers detailed planting instructions and recipes on each packet, with hand–drawn artwork by botanical artists. Everything about Rare Earth candles is 100% sourced from the earth, such as beeswax and non–GMO soy wax sourced from farms in the Midwest. Natural mineral colors, hemp wicks, and 100% essential oil fragrances make these pillars a lovely addition to every room in your house. Varieties like Cairo, Provence, Bali, Istanbul, Valencia, Fiji, and Barcelona scent your space with fragrances reminiscent of each exotic destination. What’s simple, eco–friendly, raw, sustainable, natural, responsible, handmade and green? 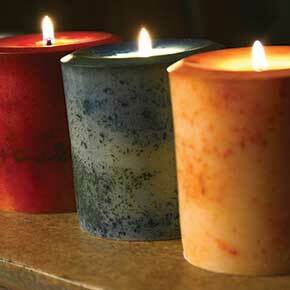 Answer: products from Berkeley–based company Be Home. Not only are Be Home’s kitchen utensils and serving pieces incredibly beautiful, but each piece is fashioned out of reclaimed wood, olive and mango wood from dried–out, non–fruit–bearing trees or teak wood remnants from the logging industry. No new trees are cut down to manufacture Be Home’s products. 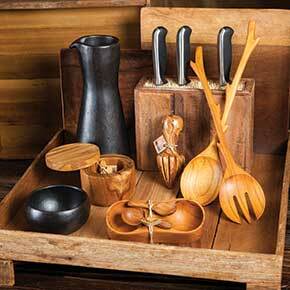 Every item is hand–made, which only adds to the unique character of each piece. Start Your Grinnin’ and Drop Your Linen! 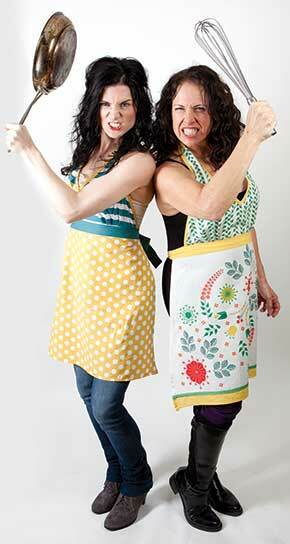 Decidedly functional and truly beautiful linens are what Now Designs and Danica Studio is all about. We offer this company’s fresh selection of linen towels and aprons that fit perfectly into today’s modern, stylish kitchens. Made from the flax plant (sustainable and fast growing), linen is one of the best kitchen textile materials, and these linen items bring a splash of color and earthy texture to your home. And it’s not just linen products on our shelves, we also have a wonderful variety of Now Designs’ cotton aprons, towels, mugs and assorted kitchen wares. 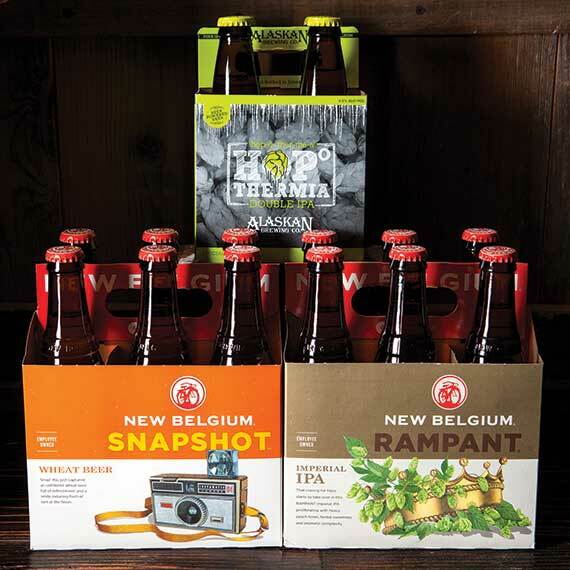 New Belgium Brewing, a long–time proponent of sustainable, environmentally friendly practices (like 100% wind–powered electricity, on–site water treatment and use of evaporative coolers), brings you Rampant IPA and Snap Shot Wheat. Rampant IPA is a Northwest Style IPA, where the hops are noticeable but not overpowering, instead adding to the overall complexity. New to New Belgium’s flavor roster is the Snap Shot Wheat, perfect for spring and summer here in the valley. The wheat malt base makes for a crisp lighter–bodied beer with citrus notes, refreshing on a warm summer day. When it comes to innovative sustainable practices, Alaskan Brewing Company leads the way and is the first American craft brewer to install a carbon dioxide reclamation system. Alaskan Brewing Company’s newest creation—Hop Thermia Double IPA —is a rich–copper colored ale with fresh hop aromas bursting forth from each glass. Medium carbonation provides a creamy texture that frames the hop bitterness. 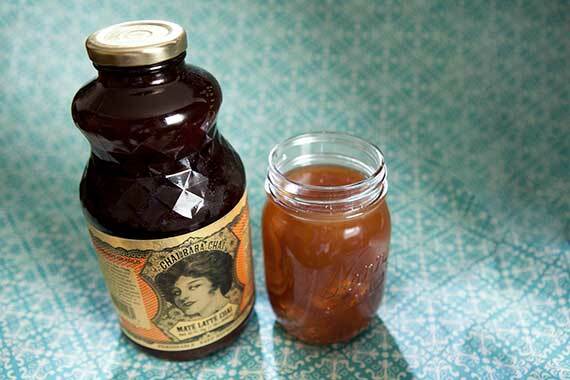 Try a glass with smoked gouda cheese for a tasty pairing. Looking for something stylish and fun to tote your tater tots? 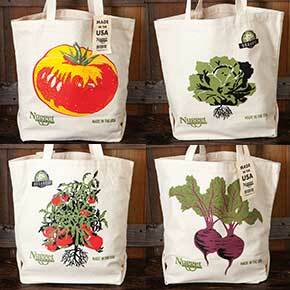 Check out Nugget Markets new reusable canvas grocery bags. Available in two styles, they’re not only fun to look at, but they’re sturdy, environmentally friendly, made in the USA, and darn cute to boot. For the purest, freshest taste, drink from a glass! We’ve got Lifefactory’s glass water bottles in 22–ounce, 16–ounce, and 12–ounce sizes and they’re perfect for the gym, kids backpacks, lunches, etc. Plus, drinking from glass is the healthiest way to hydrate with no metallic or chemical tastes, and nothing leaches into your beverage, thanks to glass composition. 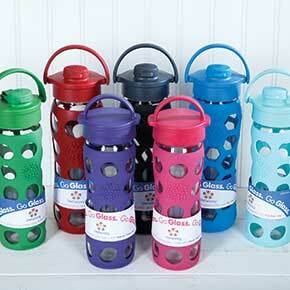 Made in great colors and a unique design, Lifefactory’s water bottles are functional and “green,” too. Any way you celebrate, we have what you crave to make your celebration a memorable one! 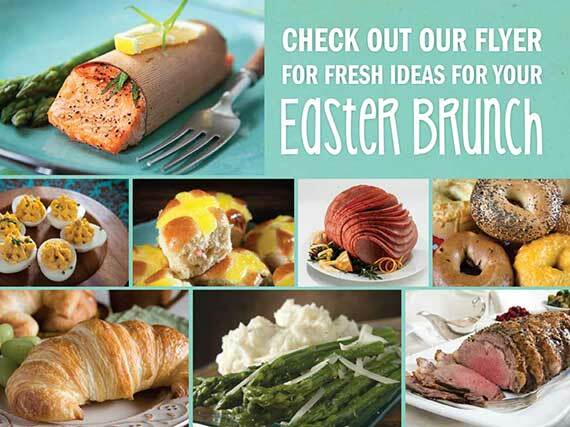 Check out our handy brochure filled with great Easter ideas! It’s a Big Day to Give! We’re partnering with our and Give Local Now for the Big Day of Giving 24-hour online giving challenge. The Big Day of Giving starts at midnight on May 6th and folks can donate from the heart to those local organizations that mean the most to each person. We’ve contributed to the matching fund pool to boost each donation and make an even bigger impact. More than 400 local organizations can benefit from this charitable giving campaign. It’s a great way to support a favorite non-profit or to help a group that’s new to you but provides services that are near and dear to your heart. Visit www.givelocalnow.org to donate and to see each group’s profile, including its board members, projects and activities, and three years’ of financial data to ensure a track record of doing good things in our community. On the Big Day of Giving, it’s never been easier or more rewarding to give from the heart! Get your wine tasting on at one of the following Nugget Markets locations tonight from 5 p.m. - 7 p.m. The cost per flight is just $5 and attendees must be at least 21 years of age. April is Autism Awareness Month, and we're proud to support the MIND Institute’s family-oriented open house. This free event features entertainment, food trucks, balloon artist, climbing wall, plus participation by community resource organizations. At the MIND Institute, 2825 5th St. in Sacramento. 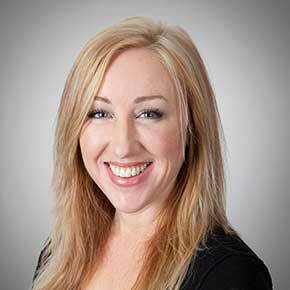 We’re proud sponsors of the American Heart Association’s 2014 Go Red for Women program and the Sacramento area’s AHA Go Red for Women luncheon on May 2. Nugget Markets is a long-time supporter of the American Heart Association’s Go Red for Women campaign, which strives to spread heart-health awareness and education to our communities. Prices valid April 16-22, 2014.